Let all the nations be gathered together and let the people be assembled. Isaiah 43.9. I will remember the works of the Lord, Surely I will remember the wonders of old. Psalms 77.2. Hoc monvmentvm et insignissimvm principem albertvm commemorans et spectacvlvm vniversale qvod ispe anno MDCCCLI faciendvm cvravit in pvlcherrimis illis hortis eivs anno MDCCLXIII positvm est qvibvs dirvtis hic circa annvm MDCCCXCI itervm est erctvm tvm refectvm renovatvm repartvm a celsitvdine sva regia dvce edinbvrgensi consilii regalis de spectacvlo albertensi praeside inavgvratvm est mense maio MMI. Opened by Her Majesty Queen Victoria, May 1st 1851. Erected by public subscription originally intended only to commemorate The International Exhibition of 1851 now dedicated to the memory of the great author of that undertaking The Good Prince to whose far-seeing and comprehensive philanthropy its first conception was due and to whose clear judgment and untiring exertions in directing its execution the world is indebted for its unprecedented success. Albert Francis Augustus Charles Emanuel, The Prince Consort, born August 26, 1819, died December 14, 1861. "He was a man, take him for all in all, we shall not look upon his like again"
Designed by Joseph Durham with modifications by Sydney Smirke. Inaugurated by the Prince of Wales, the future Edward VII. Sharp-eyed Charles Watson has pointed out what looks like a stonemason's error. The "wonders of old" quote comes from Psalms 77:11 not 77:2. Seems someone converted what they thought was a Roman II into a 2. Of course this could have been whoever prepared the text that the stonemason was copying - we'll never know. This monument is just south of the Albert Hall. This whole area was at one time nicknamed Albertopolis as it was bought out of the profits of the Great Exhibition for which Prince Albert was the driving force. Once purchased the area was filled with cultural and educational buildings, many of which remain. e.g. Imperial College, Natural History Museum, Royal Albert Hall, Royal College of Music, etc. 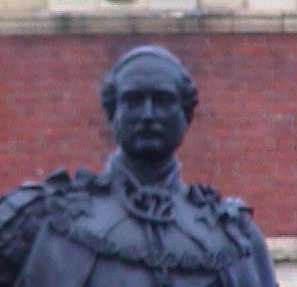 The original idea was to erect a monument to Prince Albert in Hyde Park on the site of the Great Exhibition. A committee was formed. Albert did not want such a statue and over time the idea changed to be a monument to the Great Exhibition with a figure of, first Britannia, and then Queen Victoria. Also the site for the memorial was changed to be in the show gardens of the Royal Horticultural Society, where the Prince Consort Road now runs. This all dragged on (look at the size of the committee!) and then, 10 years after the Exhibition had closed, Albert died. Within a few days the Queen had requested that his statue replace hers on the monument. Erected in the RHS gardens in 1863, the monument was moved to its present site in 1891-3 when the gardens were built over and the Prince Consort Road created. More details at British History On-line. Sculptor. Born London. Died London.